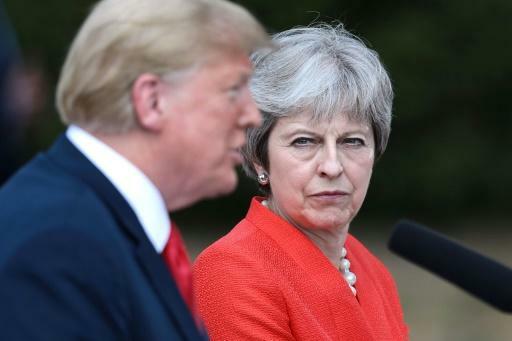 US President Donald Trump told British Prime Minister Theresa May she should sue the European Union rather than negotiate with them, she said Sunday. May said Trump's self-declared "brutal" option in the Brexit negotiations was to sue Brussels, shedding light on his mysterious suggestion that has hung over their talks and his four-day visit to Britain. "He told me I should sue the EU. Sue the EU," May told BBC television. In an interview with The Sun newspaper on Thursday ahead of his talks with May, Trump said he had told May how to deal with Brussels but she "didn't listen". "I would have done it much differently. I actually told Theresa May how to do it but she didn't agree, she didn't listen to me. She wanted to go a different route," he said. "She probably went the opposite way." In a press conference after their talks Friday, Trump said it had been a suggestion rather than advice. "I think maybe she found it too brutal," he said, standing alongside May, without revealing the details. "I could fully understand why she thought it was tough. And maybe someday she'll do that. If they don't make the right deal she may do what I suggested but it's not an easy thing." And when pressed in a newspaper interview afterwards, Trump still declined to reveal what his suggestion was. "I recommended her something, I gave her an option, I'd rather not tell you what that option is, but I think she might," he told The Mail on Sunday newspaper. "I think it would've been great, but it's not too late for her to do that, necessarily." May finally revealed what Trump had told her. "He told me I should sue the EU. Sue the EU. Not go into negotiations, sue them. Actually, no, we're going into negotiations with them," she said. "What the president also said at that press conference was don't walk away. Don't walk away from negotiations because then you're stuck," she added. "So I want us to be able to sit down to negotiate the best deal for Britain." May's proposals for Britain's future relationship with Brussels, published Thursday, foresee an overall "association agreement" with the EU encompassing different deals on different areas.